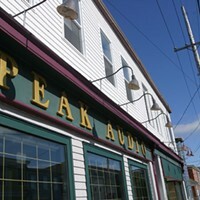 Turning it up to 11 for another year is the north end speaker-heads over at Peak Audio. Come on, don’t be that dude who puts his phone in a glass when the party’s going. Get yourself correct with some new toys from Peak Audio. From noise-cancelling headphones to turntables and amps, to at-home services including TV mounting and custom home theatre setups, Peak remains king of the auditory hill as Halifax’s one-stop shop for high fidelity fun.